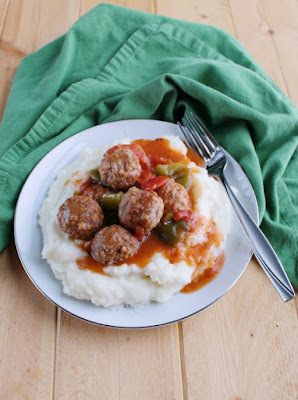 Enjoy the flavors of Swiss steak, but made even simpler. 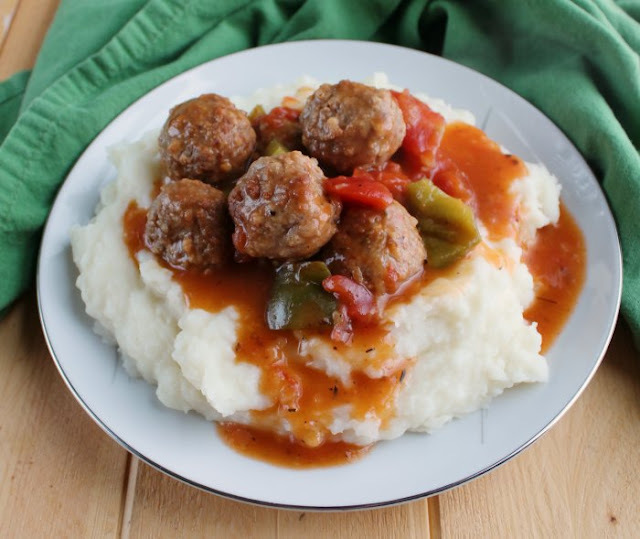 Swiss steak style meatballs are ready in no time in the instant pot. 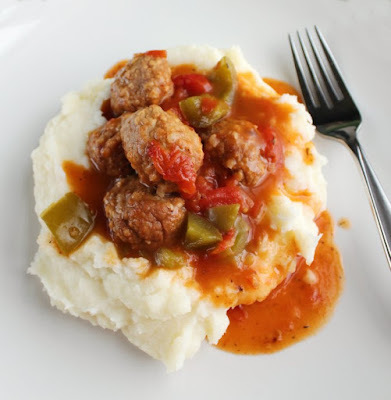 The classic flavors of Swiss steak are made super fast and easy in this shortcut recipe. Have dinner on the table in no time. 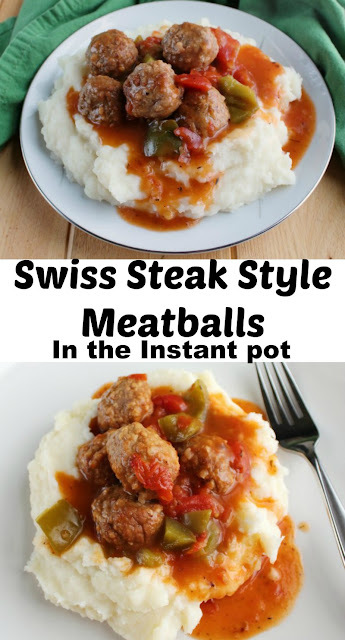 Swiss steak style meatballs in the instant pot will become a requested meal you'll be happy to make! I have been having so much fun experimenting with the instant pot lately. It is so versatile and makes getting dinner on the table quickly a lot easier. I've been challenging myself to take classic flavor combinations and give them a twist all while developing super quick and easy recipes perfect for busy families. It's been a tasty challenge! The recipe for creamy spaghetti and meatballs in the instant pot got me thinking. Using frozen meatballs really cuts the time required. So why not try them in more kinds of recipes? There's no reason they have to go with pasta! That is where this idea came from. 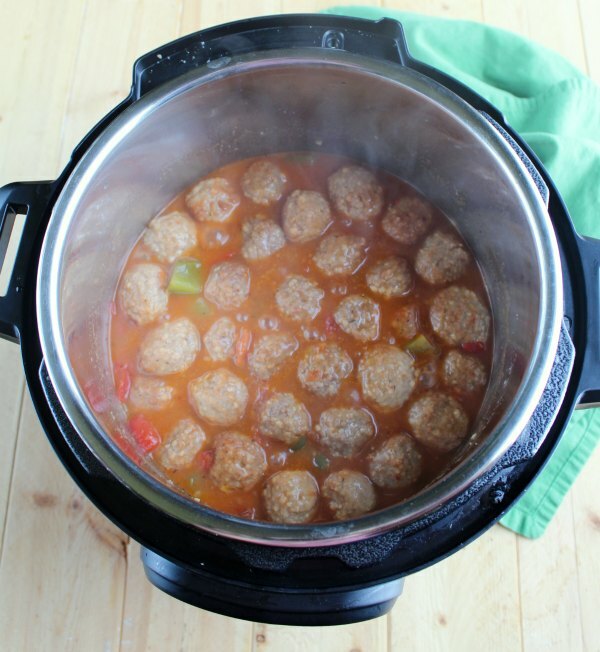 If I have a bag of frozen meatballs in the freezer, what are some fun ways to use them in simple recipes? Well, that and a recent conversation about Swiss steak with some coworkers! It seemed like a perfect jumping off point for a delicious dinner! The hardest part about this is chopping the veggies and you can have that done in a couple of minutes! 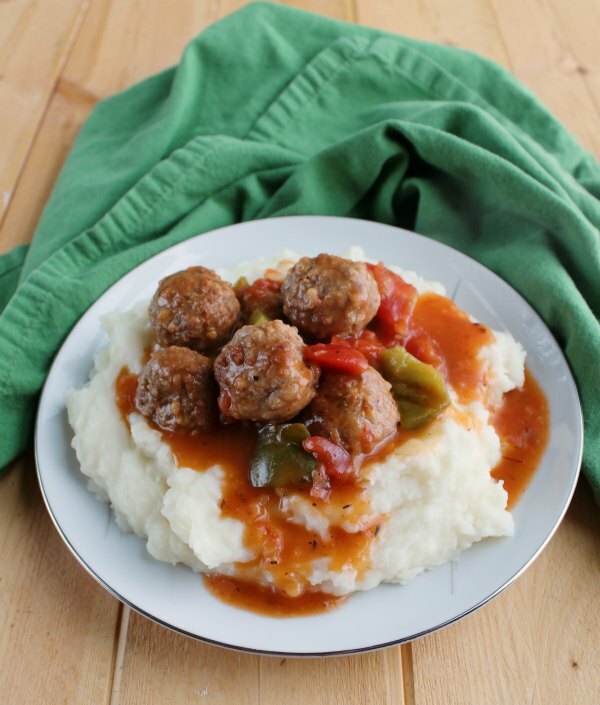 While the meatballs cook, you can whip up some mashed potatoes, rice or egg noodles to serve with them. You'll be eating a satisfying meal in no time at all! What are your favorite quick and easy meals? If you like a thicker sauce, you can always add a cornstarch slurry to the mix after the pressure cooking is done. Just stir in a couple of teaspoons of cornstarch mixed with a Tablespoon or so of cold water and cook on simmer until thickened. If the burn warning comes on, the sauce got too thick to early. Stir in a little more liquid and scrape up anything stuck to the bottom of the pan. 1. Spray instant pot liner with cooking spray. 2. Chop onions and green pepper. 3. 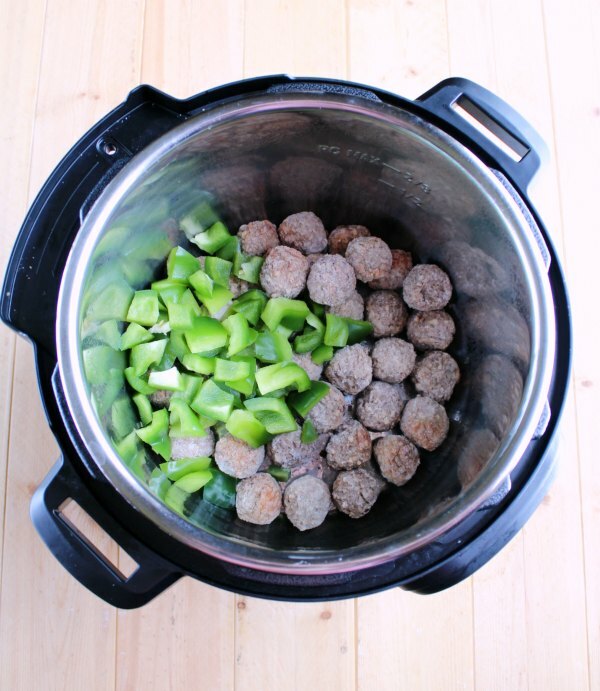 Add meatballs, peppers and onions to instant pot. Sprinkle with flour, salt, pepper, garlic powder and thyme. Toss to coat. 4. Add tomatoes and beef broth. Pressure cook on high pressure for 7 minutes. Quick release pressure. 5. If thicker gravy is desired, stir together water and cornstarch. Stir into sauce in pot and cook on saute until thickened. 6. Serve over egg noodles, rice or mashed potatoes. What a great idea! Pinned for dinner soon! I'm so happy to see your recipes back on line. Hope things are good for you. Hi Carlee, this is my husbands kind of food. He loves meatballs and mash and complains I don't do them enough. I'm sure he would do flips for a plate of your Swiss steak style meatballs! He and I would get along famously! Thank you! This looks yummy, especially paired with the mashed potatoes! 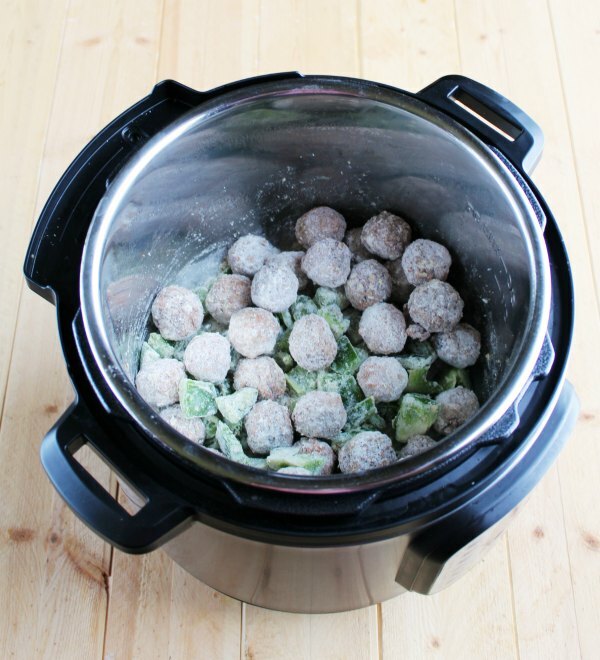 I can't wait to try this recipe in my new Instant Pot,it sure looks good! Hope you are having a good week and staying warm. Thanks so much for sharing with us at Full Plate Thursday!